Meyers is a full-service, one-stop shop for custom POS displays, labels, and promotional products. Their focus on customer service through teamwork has earned them the confidence of America’s top retailers. CEO, David Dillon, returned to the family business after a stint with a venture-backed, web-technology business start-up. As the new CEO, he enthusiastically introduced better ways of doing things at a higher operational level, but soon realized he needed to do more. Net profit is up, despite flat revenue in the Label Group. This is due to higher margins and higher value account relationships. The POS group drove highly profitable 14 percent top-line growth. They even exceeded their stretch goal. They now employ 30 percent fewer salespeople. They optimized existing company resources. They drastically reduced the cost of bad sales hires. Recruiting and hiring salespeople is now a formalized strategic process. The quality of sales generated improved significantly due to strengthened sales coaching and sales performance management. Accountability is measured and sales analysis flowcharts map out seven steps for every sales opportunity. It’s challenging to build a high-performance sales team. Many leaders are frustrated and say they struggle to work with their Millennials in the workplace. Despite their frustrations, some CEO’s, business owners, and sales managers are reluctant to enlist the services of external consultants. They fear that an outsider will not understand their company culture, it will take too long, and it will be too costly. While David first focused on “fixing the boat” with Six Sigma, one of his executive colleagues had heard Danita Bye speak at an industry organization event. He was immediately pulled in by her comprehensive, holistic sales effort approach and suggested they set up a meeting with her. Start with accurate information and insights. It’s easy to make decisions based on gut reaction or past performance. We wanted objective data so we could get clarity on next steps. Step back before moving forward. It takes time to assess, develop and implement new sales management processes. Stay committed to continuous improvement. Take milestone measurements. Determine how well each process works, tweak and then continue. Stop tolerating salespeople who are disengaged and do not have the determination and sales DNA needed to succeed. 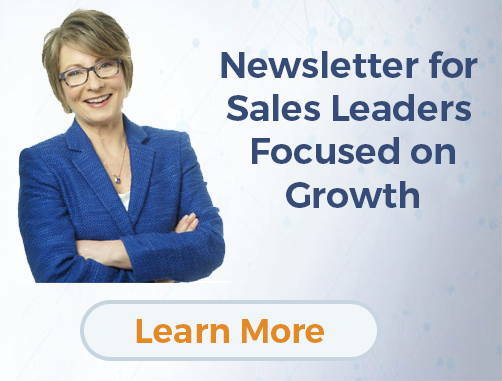 Implement training and sales coaching processes to raise the bar at all levels in the sales organization — executive, management, and salespeople. Has it paid off? Dillon wholeheartedly agrees that the new approaches Danita and her team introduced, contributed significantly to the company’s improved sales growth. The divisional presidents ascribe their journey in growing a more profitable business to the focus shift that Danita brought to their executive table. Implement an objective assessments process to examine sales systems, processes, and recruitment practices. This assessment revealed areas that needed attention, both short-term and long-term. Prioritize leadership team development. The leadership team attends executive level workshops. They report that a seminar regarding how to optimize their sales management process really hit the mark. It highlighted the amount of time wasted on answering RFPs they never had a chance of getting. Refine sales analysis to decipher which prospects offer the best opportunities. They optimized those prospects to grow their close rate. They believe this is the reason they are driving new business and have increased their sales growth and margins. Streamline salespeople and learn how to improve your sales performance management. They gained valuable insight into leveraging the unique strengths within the team dynamic. Danita and her team assisted Meyers to assess its current sales force and non-selling support staff. Then, they established a proven process for assessing and hiring salespeople. Reduced employee turnover. In the past, we were hiring 10 people to get one good one. They were shocked to learn what the actual cost of one bad sales hire is! Optimized sales hiring processes. The comprehensive objective process for attracting, recruiting, screening, and hiring salespeople, resulted in their sales team being 30 percent smaller. Increased hit rate on incoming requests. “Our focus is sharper, and the clutter is gone,” the VVP of Sales explains. Improved team collaboration between customer service and sales staff. Higher levels of employee engagement are driving productivity and performance. Initially, some employees left because they fought the new environment, or couldn’t execute it. However, Meyers is now experiencing an overall boost in employee morale and current retention is much higher. This is the result of the company applying several of Danita’s sales management processes and tools. A built-in incentive drives focus to higher value products. Their most successful people are selling value. Their clients now regard the salespeople as trusted resource partners in their businesses. They started putting the full court press on three or four great prospects. They created a Focus 250 list and narrowed it down to their Focus 25. They focused on the right behaviors, beliefs, skill sets, and prospects. They drastically reduced the cost of bad sales hires. Recruiting and hiring of salespeople is now a formalized strategic process. Meyers’ executives agree that the company has undergone a cultural change. Danita’s coaching strategies and sales management processes gave them a common language that is part of the backbone of their new culture. As the executive team of Meyers discovered, allowing an outside expert to get your business back on a healthy growth track, does not have to be a costly nightmare! An external, objective perspective might diffuse the emotional turmoil that is often associated with multi-generational business environments. The sales management processes and sales coaching strategies that my team and I introduced, are based on bedrock principles. If you need to upgrade your sales, we can do the same for your company. If you need guidance to get your Millennial sales team on a healthy growth track and upgrade your sales, contact me today to set up a FREE one-hour consultation.